By 2020, the number of independent workers and freelancers are expected to comprise 40% of the working population. This subset of the economy requires different work configurations, and as a result, co-working spaces have emerged as a new office typology. While research has been conducted on the internal dynamics and impact on the worker in the new space, there has been little study into the impact of co-working spaces on the immediate community. Reports released by municipalities recognize the potential impact that co-working spaces have on economic development - however they are policy recommendations. 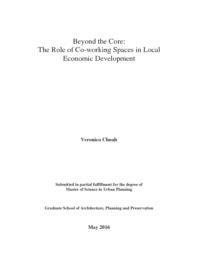 The purpose of this paper is to expand on the relationship between co-working spaces and its surrounding community's economic development by collecting and analyzing both qualitative and quantitative data. Co-working space users will be surveyed on their perception of the surrounding neighborhood and gauge their participation in the community events while various community members and stakeholders will be interviewed about their opinions of the co-working space and any perceived changes associated with the new neighborhood fixture. Supplementing this qualitative data, demographic data and building/construction statistics will be analyzed pre and post opening of the co-working space. As co-working spaces evolve from being an office alternative outlier to viable office option, developing an understanding of co-working spaces’ impact on the surrounding community is essential – integrating co-working spaces into the urban fabric. Co-working space have the potential to play a significant role in local economic development but there must also be community and local government communication and commitment to provide neighborhood services and amenities in order to tap into the potential of co-working spaces.